Notes app behaves more like a piece of paper than ever in iOS 11. Up until now, if you wanted to do fancy formatting with the iOS Notes app, you had to dust off your Mac to do it. 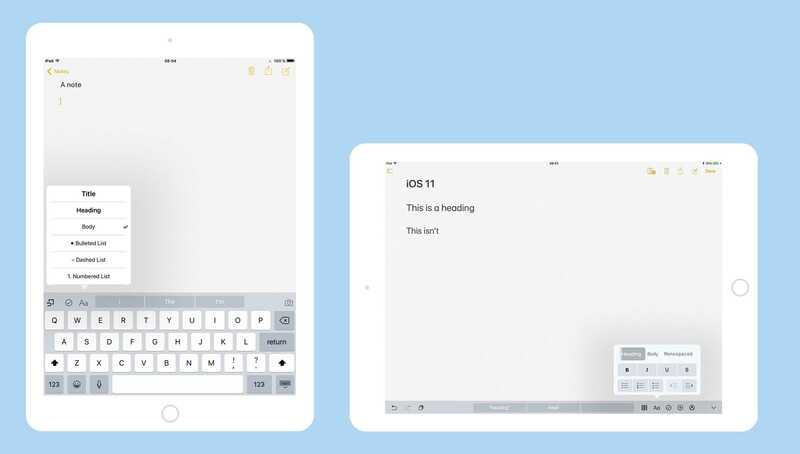 Now, with the iOS 11 Notes update, you no longer need to boot up a desktop computer just to switch a note to a monospaced font, or add a table. You can do it all on your iPhone or iPad. And this is in addition to the great new in-line sketch features and document scanner that headline this update. In iOS 11, there’s a new set of tools above the keyboard. The little + replaces the old camera icon, and now includes options to add a sketch in the old-fashioned way, by creating a full-screen canvas and then attaching whatever you draw to the note; scanning a document and save it in Notes, ready to mark it up with the Apple Pencil; and either snapping a photo or adding one from your library. Before and after: the text options have gotten better in iOS 11. Tapping the little Sketch icon (a pen tip) brings up the pen controls, and you can just start drawing with the Apple Pencil anywhere in the page, just liken paper. The checkmark icon remains, letting you start a checklist, and now the Aa text button allows you to do proper formatting. As you can see in the screenshots, you now get options to make the text monospaced, as well as options for bold, italic, underlined and strikethrough. You can also indent text (to make nested lists, for instance), and all this is in addition to the list and Title/Heading/Body options from iOS 10. The Notes app looks almost exactly like it did before, only it’s a lot sleeker and more feature-laden. In short, it now behaves like you expected it to when it got its last shiny makeover — especially if you use the Apple Pencil.